00033 Problem Solver 1/8” x 14” 5 lb. 02732 Cast Iron 1/8” x 14” 1 lb. 01621 Steel 3/32” x 14” 1 lb. 01623 Steel 3/32” x 14” 5 lb. 01631 Steel 1/8” x 14” 1 lb. 01633 Steel 1/8” x 14” 5 lb. 06621 Rustbuster 3/32” x 14” 1 lb. 06623 Rustbuster 3/32” x 14” 5 lb. 06631 Rustbuster 1/8” x 14” 1 lb. 06633 Rustbuster 1/8” x 14” 5 lb. 01932 Aluminum 1/8” x 14” 1 lb. 08025 Brazing 3/32” x 14” 0.8 lb. 09922 Cutting 3/32” x 14” 0.8 lb. 52332 Nickel Free Cast Iron 1/8” x 14” 1 lb. 52333 Nickel Free Cast Iron 1/8” x 14” 5 lb. 52122 Nickel 55 Electrode 3/32” x 10” .8 lb. 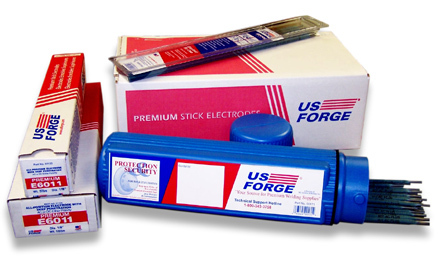 52132 Nickel 55 Electrode 1/8” x 14” 1 lb. 52133 Nickel 55 Electrode 1/8” x 14” 5 lb. 52134 Nickel 55 Electrode 1/8” x 14” 10 lb. 52222 Nickel 99 Electrode 3/32” x 10” .8 lb. 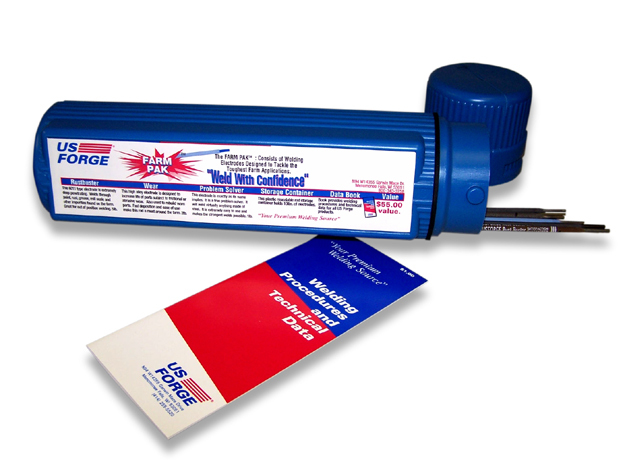 52232 Nickel 99 Electrode 1/8” x 14” 1 lb. 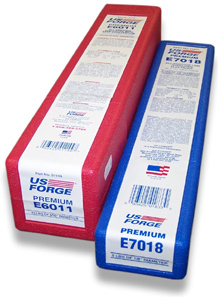 52233 Nickel 99 Electrode 1/8” x 14” 5 lb. 52234 Nickel 99 Electrode 1/8” x 14” 10 lb. Superior abrasion resistance – “hardfacing” means to put a protective layer of material on a surface to prolong the life of the part. A more appropriate word use for this activity is “wearfacing”. To effectively wearface a part is to extend that parts life. 54632 Wearfacing 1/8” x 14” 1 lb. 54633 Wearfacing 1/8” x 14” 5 lb. 54732 Hardfacing 1/8” x 14” 1 lb. 54733 Hardfacing 1/8” x 14” 5 lb. Stainless Steel covered electrodes produce smooth, tough welds with the strength, corrosion resistance, and crack resistance needed for welding stainless steel. 50222 Stainless Steel 3/32” x 14” 1 lb. 50223 Stainless Steel 3/32” x 14” 5 lb. 50822 Stainless Steel 308L 3/32” x 10” .8 lb. 50823 Stainless Steel 308L 3/32” x 10” 4 lb. 50824 Stainless Steel 308L 3/32” x 10” 10 lb. 50832 Stainless Steel 308L 1/8” x 14” 1 lb. 50833 Stainless Steel 308L 1/8” x 14” 5 lb. 50834 Stainless Steel 308L 1/8” x 14” 10 lb. 50842 Stainless Steel 308L 5/32” x 14” 1 lb. 50843 Stainless Steel 308L 5/32” x 14” 5 lb. 50844 Stainless Steel 308L 5/32” x 14” 10 lb. 50922 Stainless Steel 309L 3/32” x 10” .8 lb. 50923 Stainless Steel 309L 3/32” x 10” 4 lb. 50924 Stainless Steel 309L 3/32” x 10” 10 lb. 50932 Stainless Steel 309L 1/8” x 14” 1 lb. 50933 Stainless Steel 309L 1/8” x 14” 5 lb. 50934 Stainless Steel 309L 1/8” x 14” 10 lb. 50942 Stainless Steel 309L 5/32” x 14” 1 lb. 50943 Stainless Steel 309L 5/32” x 14” 5 lb. 50944 Stainless Steel 309L 5/32” x 14” 10 lb. 50622 Stainless Steel 316L 3/32” x 10” .8 lb. 50623 Stainless Steel 316L 3/32” x 10” 5 lb. 50624 Stainless Steel 316L 3/32” x 10” 10 lb. 50632 Stainless Steel 316L 1/8” x 14” 1 lb. 50633 Stainless Steel 316L 1/8” x 14” 5 lb. 50634 Stainless Steel 316L 1/8” x 14” 10 lb. 50642 Stainless Steel 316L 5/32” x 14” 1 lb. 50643 Stainless Steel 316L 5/32” x 14” 5 lb. 01932 Aluminum 1/8” x 14” 5 lb. 01933 Aluminum 1/8” x 14” 10 lb. 01302 Easy Strike 6013 1/16” x 10” .5 lb. 01312 Easy Strike 6013 5/64” x 10” .5 lb. 01402 Easy Strike 7014 1/16” x 10” .5 lb. 01412 Easy Strike 7014 5/64” x 10” .5 lb. 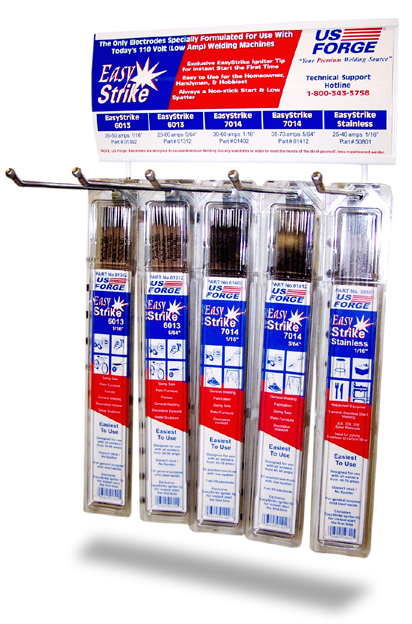 50801 Easy Strike Stainless 1/16” x 10” .5 lb. 02102 Copper Coated Steel Rod 1/16” x 18” 1 lb. 02103 Copper Coated Steel Rod 1/16” x 36” 5 lb. 02122 Copper Coated Steel Rod 3/32” x 18” 1 lb. 02123 Copper Coated Steel Rod 3/32” x 36” 5 lb. 02132 Copper Coated Steel Rod 1/8” x 18” 1 lb. 02133 Copper Coated Steel Rod 1/8” x 36” 5 lb. 02222 FC Low Fuming Bronze Rod 3/32” x 18” 1 lb. 02223 FC Low Fuming Bronze Rod 3/32” x 36” 5 lb. 02232 FC Low Fuming Bronze Rod 1/8” x 18” 1 lb. 02233 FC Low Fuming Bronze Rod 1/8” x 36” 5 lb. 02322 Bare Low Fuming Bronze Rod 3/32” x 18” 1 lb. 02323 Bare Low Fuming Bronze Rod 3/32” x 36” 5 lb. 02332 Bare Low Fuming Bronze Rod 1/8” x 18” 1 lb. 02333 Bare Low Fuming Bronze Rod 1/8” x 36” 5 lb. 02532 Self Fluxing Aluminum Rod 1/8” x 18” 1 lb. 02533 Self Fluxing Aluminum Rod 1/8” x 36” 5 lb. 02403 Bare Aluminum Rod 1/16” x 36” 5 lb. 02422 Bare Aluminum Rod 3/32” x 18” 1 lb. 02423 Bare Aluminum Rod 3/32” x 36” 5 lb. 02432 Bare Aluminum Rod 1/8” x 18” 1 lb. 02433 Bare Aluminum Rod 1/8” x 36” 5 lb. 02903 Flux-Coated Silver Brazing Rod 1/16” x 18” 1 lb. 02923 Flux-Coated Silver Brazing Rod 3/32” x 18” 1 lb. 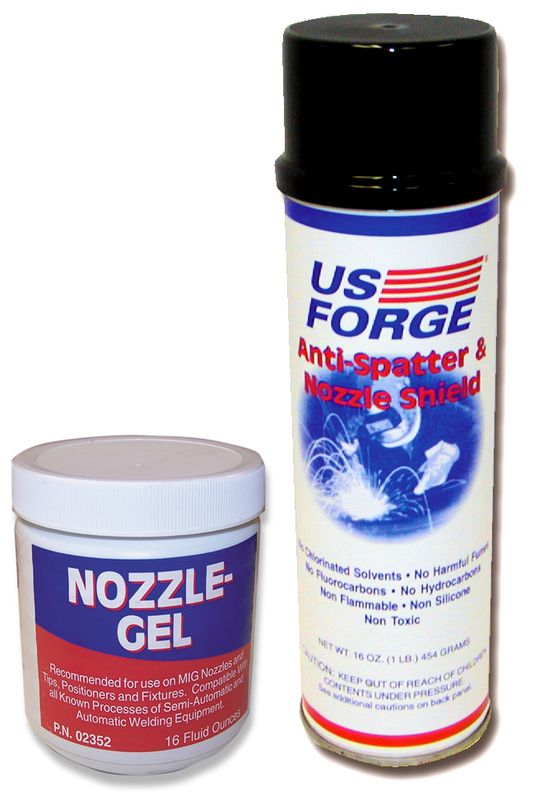 02352 Nozzle Gel 16 oz. 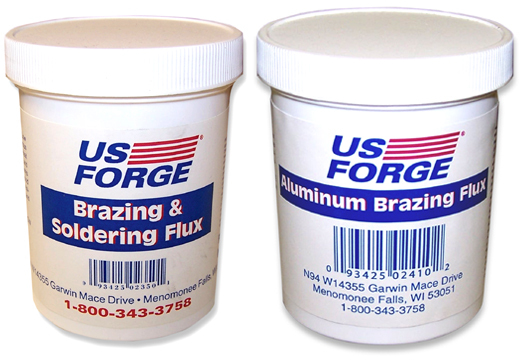 02350 Brazing Flux 8 oz.